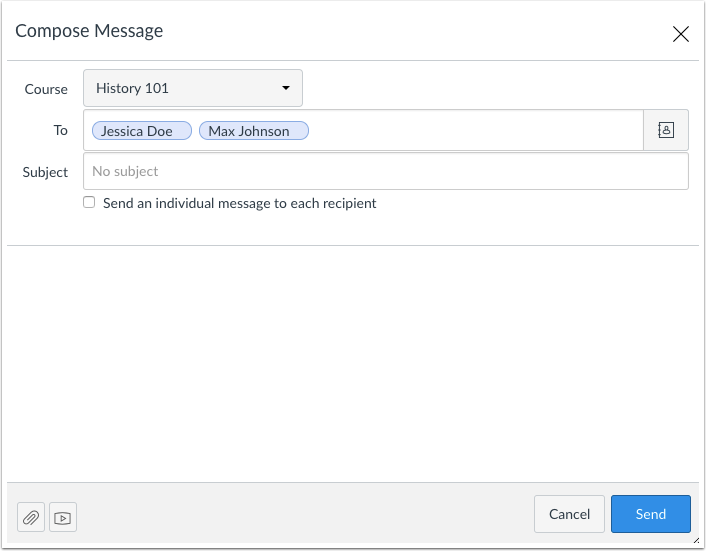 In Conversations, you can send a message to one user or multiple users in a course. Currently you cannot message users in multiple courses. You can also send a message to yourself, but messages can only be viewed in the Sent messages folder. Once a course has concluded, you will only be able to message instructors or TAs in that course. In the Courses drop-down menu, select the course where you want to send your message. 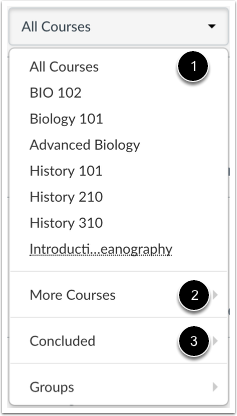 You can filter your courses by current favorite courses  or more courses . Note: When filtering by Concluded Courses , you can only send a message to instructors (teachers). To add a user, you can search for the user in the To field  or you can use the Course Roster . To search for a user, type the user's name in the To field. Canvas will automatically populate matching names. If multiple names appear, use the arrow key to select the user's name. Then press the Enter key. The user's name will appear in the To field, highlighted in light blue. To send a message to multiple users, type the names of the users in the To field. Note: If you have a long list of recipients, the To field will only show 5 lines before scrolling is enabled. 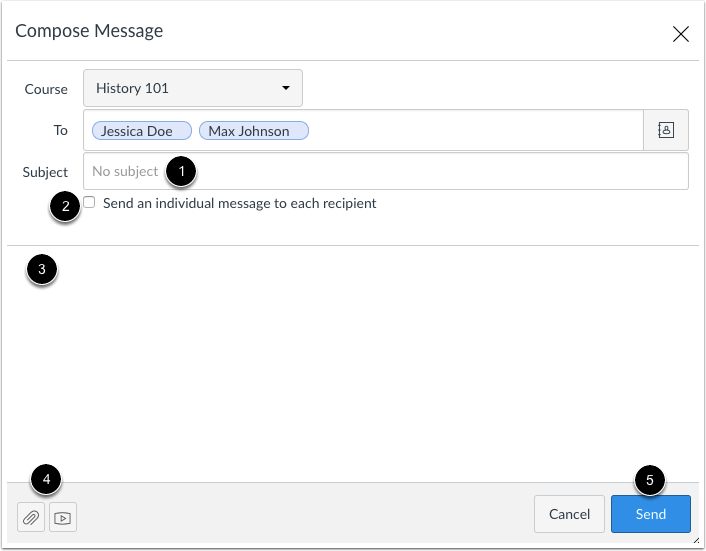 If you select the Send individual messages checkbox, individual messages for all recipients will be created. To select a user from the course roster, click the Address Book icon next to the To field . From the address book, locate the user's role  and then select the user's name . Names are arranged by last name. To navigate back to the course roster, use the arrow icon . 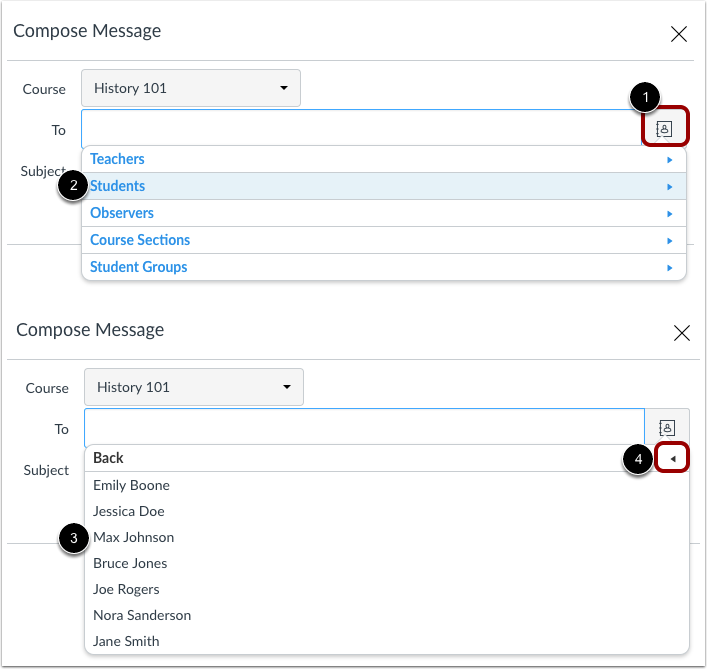 To send a message to multiple users in the course roster, press the command key (Mac) or the control key (Windows) and click the name of each user you'd like to add to your message. Pressing the keyboard key will keep the roster window open. Previous Topic:How do I star a conversation as a student? Next Topic:How do I send a message to a user in a group in Conversations as a student? Table of Contents > Conversations > How do I send a message to a user in a course in Conversations as a student? Re: How do I set up an address book? Re: How do I message other students and teachers?